In the image below I’ve made a new file 800 X 600 @ 72 dpi and filled it with white. Created a new layer above that and made a selection toward the bottom of the image and filled it with a lightish grey, they inverted the selection and filled it with a darker grey. I then blurred that layer using Gaussian Blur at 3 or 4 pixels. I then created a new blank layer above that and with the Rounded Rectangle Tool (set to Fill Pixels) I drew out a shape, the f/ground colour was set to white. Ctrl + T to bring up the Transform tool and right click to choose Distort, I then distorted the image. Ctrl + J to duplicate layer, Locked the Transparency of the layer and then filled with a different colour. Ctrl + T to transform, lock the ‘maintain aspect ratio’ in the top bar and choose 95%. Do this twice more to end up with four different colours and then reverse the order of the layers. 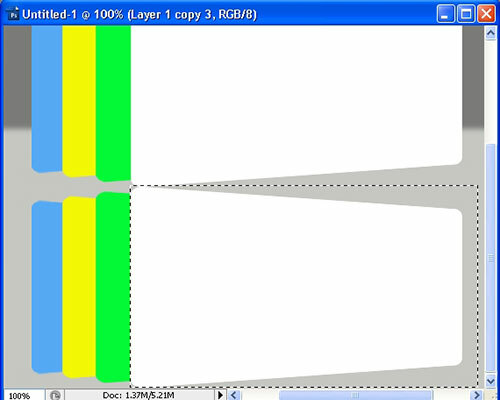 Drag out the three smaller layers to end up with something like the image below. You can use your own photos/images to do this with. Click on the top rectangle layer and then shift click on the bottom rectangle layer and then use Ctrl + E to merge those layers together. Duplicate the layer and then go to Edit>Transform>Flip Vertical. Duplicate the flipped layer and then hide it (just in case we make a dog’s breakfast of the next part) with the Move tool, drag the flipped layer down to somewhere similar to the image below. You can see the problem straight away – it’s gonna need some extra work. It’s an easy process. 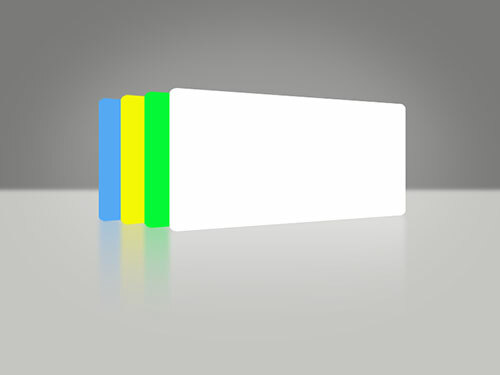 Select the Rectangular Marquee Tool and draw out a similar around the white part of the flipped layer similar to the image below. Ctrl + T to bring up the Transform Tool and then right click and choose Distort. Distort the image by using the top right handle and dragging it up, till it’s where you want it. Use the arrow keys on the keyboard for fine tuning. Ctrl + D to deselect. 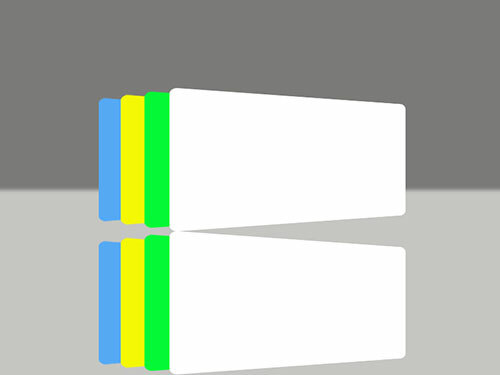 Use the Marquee tool again to select the Green (or whatever colour yours is) part of the reflection and do the same thing as you did with the white area. Take a little time to refine the edges. The very bottom of the image isn’t as important as the top area of the reflection. When you’ve done, Filter>Blur>Gaussian Blur and use about a 3 pixel radius. Add a layer mask, and with a black to transparent Linear gradient start at the bottom and draw upwards. You might end up with something like the image below. 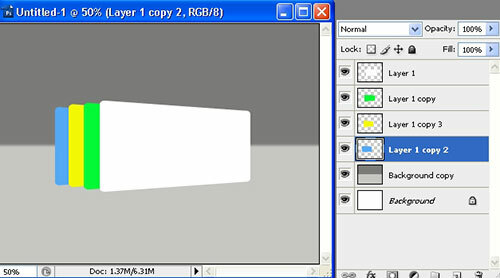 Click back on the layer with the two different greys and add a new layer above this. Grab the Elliptical Marquee Tool and draw out an oval or circle and then go to Select>Modify>Feather I used a 50 pixel radius. 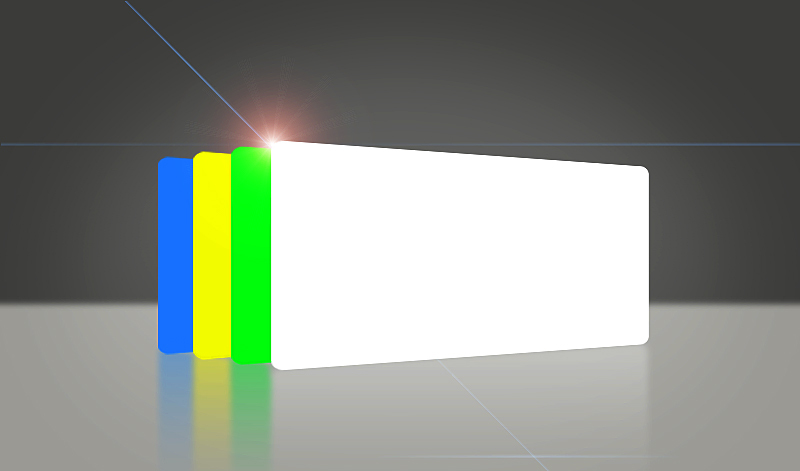 Ctrl + D to deselect – change the blend mode to soft light and add a layer mask. Using a black to transparent linear gradient, draw from the bottom up, and take the layer opacity down if you like. You might end up with something like the image below. To tie all the elements together, click on the topmost layer and then Ctrl + Shift + Alt + E to stamp visible. I used a Lens Flare, you could also use lighting effects or something else to tie the whole image together. I then cropped some space from the bottom of the image, duplicated the layer and changed the blend mode to Multiply to come up with the image you see below.